Hillary Clinton recalls President Ronald Reagan and First Lady Nancy Reagan being extremely brave and empathetic on the issue of HIV/AIDS in the 1980s. 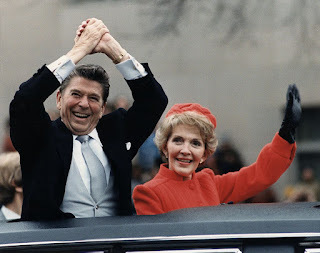 WASHINGTON (The Nil Admirari) - Earlier today, Democratic presidential candidate and former Secretary of State Hillary Clinton recalled the time President Ronald Reagan and his wife Nancy ambushed HIV/AIDS in the Oval Office. Clinton recounted how the Reagans' vicious assault killed HIV/AIDS and saved the lives of an untold number of Americans. "I remember how brave and empathetic President Ronald Reagan and First Lady Nancy Reagan were when they took on HIV/AIDS in the 1980s. They actually invited HIV/AIDS to the White House in 1987 to let it know exactly what kind of people they were," explained Clinton. Secretary Clinton continued, "When HIV/AIDS entered the Oval Office for its meeting with President Reagan, the door closed behind it and both Ronald and Nancy ambushed HIV/AIDS. They killed it after a brutal physical assault." "I was at the White House that day. I was there for tea with Nancy, and a free session with her psychic in the Roosevelt Room," explained Clinton, who asserted she could hear the battle during her psychic reading. An unidentified member of the press asked Secretary Clinton why no one else seemed to remember the bravery and empathy of the Reagans during the HIV/AIDS Epidemic. "They probably just don't know that part of the Reagan Mythology," replied Clinton.